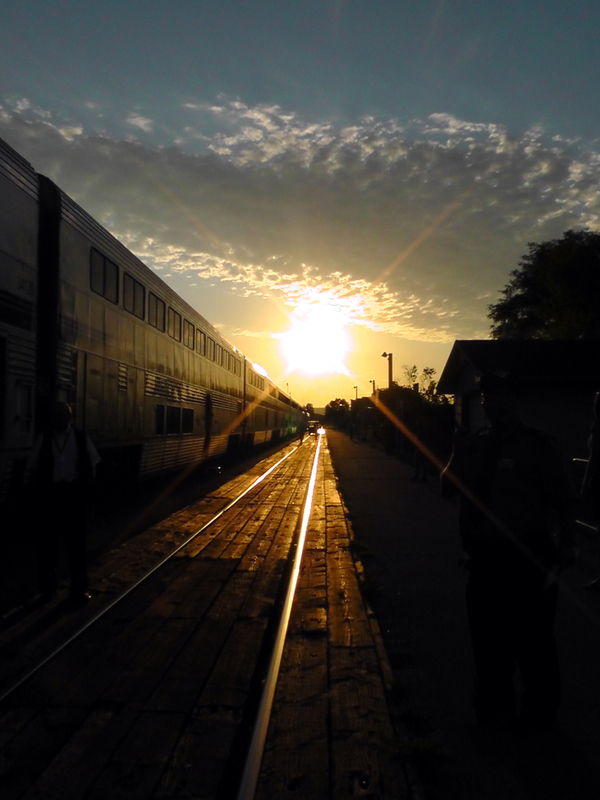 All aboard the Empire Builder | Where's my backpack? I didn’t manage to sleep a single wink during the 19 hour journey from New York to Chicago on the Lake Shore Limited. As I sat in the waiting area of Chicago’s Union Station, pondering the hellish journey behind me, and filled with dread at the 46 hour journey ahead of me, I wondered if it were possible to suffer post-traumatic-stress syndrome from train travel. Struggling to keep my eyes open, I cast a furtive glance around the waiting room. There were several Amish families in the waiting area. A large group of them were clothed in blue and black, simple but smart; the men wearing large brimmed hats and the women wearing crisp white bonnets. They looked like they were all part of the same community. But there was one family who stood apart from the rest. A tall, gentle-looking man, dressed in earth-coloured clothing like Pa Ingalls from Little House on the Prairie, entered the room with his wife. Simply clad and wearing a delicate bonnet, she radiated a beauty reminiscent of Grace Kelly, albeit without makeup and diamonds. She gently jiggled a baby up and down and was followed by a trail of the prettiest children you’ve ever seen, dressed in red and green and blue. In comparison to their blue and black clad brethren, who seemed very precise and composed, there was an ease about this family; about their way of being in the world, that was magnetic. I confess to knowing very little about the Amish culture so can offer no explanation as to why this family dressed differently. I’ve always been intrigued by the harmonious lifestyle of Amish communities; harmonious with the world around them, I mean. I’m sure sibling rivalry and squabbles are unavoidable in any family or community, but I have a deep respect for any group that chooses harmony with nature above worldly possessions. I also wish that the wearing of hats and bonnets was more widespread, as they add an air of elegance to the humblest of outfits. No-one can convince me that baseball caps are an improvement on the hats of yesteryear. My reverie was interrupted by the announcement that my train was boarding. I steeled myself against surly behaviour, still gun-shy from my trip on the Lake Shore Limited, but thankfully, boarding was a much more pleasant experience. I was greeted warmly by a chap who checked my ticket and pointed me to the right car, telling me to choose whatever seat I wanted. Further down the track, the car attendant flashed a genuine smile as he helped passengers aboard. Things were looking up. I settled into my seat, nose pushed up against the window as the train travelled north through Milwaukee and into the rural landscape of Wisconsin. It looked as though it hadn’t rained in a very long time; I felt dehydrated just gazing at the parched trees and thirsty fields. Shortly before we crossed into Minnesota, most of the Amish contingency disembarked, leaving only the family who had caught my eye in the waiting room. I got chatting with them in the observation car; a pleasant, roomy space with comfy seats and picture windows from which to admire the surroundings. I had been awake now for a day and a half but still those Amtrak seats refused to let me settle. Instead, I was mainlining coffee. As I was standing with a steaming cup of black java in my hand, the Amish man had come to my rescue and helped me locate the creamer. After that we were fast friends. The family were going on holiday to somewhere outside Portland. The children giggled excitedly as we chatted. They were having an awfully big adventure on the train. I giggled back, because I was too. As the sun began to set, the train made a brief stop and I got out for a breath of fresh air. The sinking sun glinted along the tracks as I walked along the platform. Back onboard, I watched as the train crossed the Mississippi River. People in the observation car collectively caught their breath at the sight of the water, bathed in lavender and rosy rays from the dying sun. It was the best first sight of a river ever. 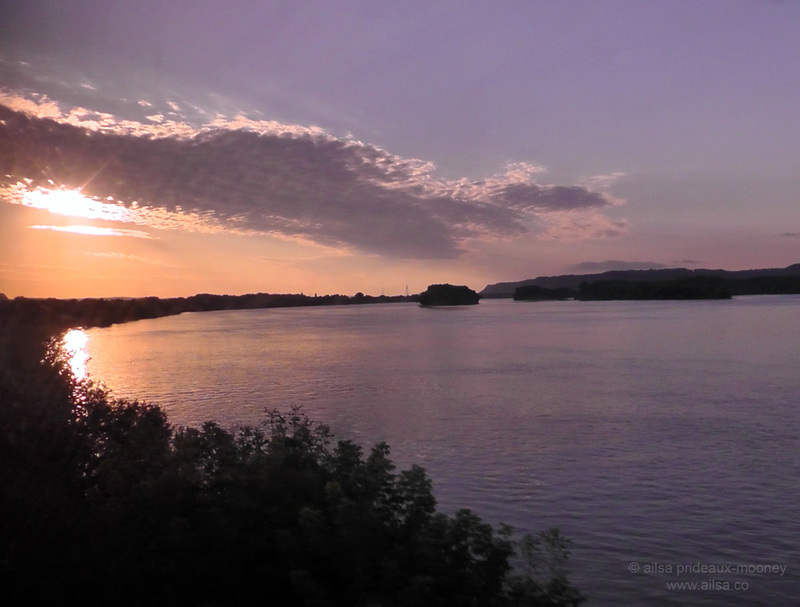 We travelled along the river for 140 miles as the sun sank lower and finally disappeared from view, leaving a delicious twilight to savour over dinner in the dining car. The food was wonderful, the service excellent, and the company fascinating. The dining car is the social hub of train travel; a place to make connections. Sharing a table, be it for breakfast or dinner, automatically makes you brothers (or sisters) in arms. This is the part of train travel I love the most; those conversations in the dining car. First comes the tentative inquiries as to your destination as the drinks order is taken. During the main course, you share stories, often about travel experiences. By dessert, you’re swapping email addresses and promising to send each other information about topics discussed. Night had firmly taken grasp by the time I returned from the dining car. It’s not as easy to ‘meet’ other people in your car, unless they’re sitting within view of you. Luckily, across the aisle from me sat a fabulous couple who were an awful lot of fun. She had her own salon and he used to work for the railroad so they knew the route well. We chatted for ages, and finally, I knew I had to sleep. I grabbed my pillow and walked resolutely to the observation car. I had a plan. I was on a mission. Earlier in the day I had spotted three upholstered seats in a row facing the big picture windows. Two right next to each other; the third at an angle forming a curiously contained seating arrangement. It also created the perfect spot to curl up along the length of all three seats and try to sleep. I lay down, shoved the pillow under my head and passed out. This entry was posted in Photography, Travel, United States and tagged photography, photos, pictures, postaday, trains, travel, writing. Bookmark the permalink. Great story! I feel as if I’m there, traveling with you. I love reading about your train trip, Ailsa. I might have to try American trains one day. I’ve taken Amtrack from Washington to New York many times; it’s fine but is only a 5 hour trip. It’s also fun to hear about America from an Irish girl’s perspective. Enjoy your trip! Yaay, glad you’re along for the journey, Anna. Great story! makes me want to get on that train! That’s a fab shot Ailsa! I am really enjoying your train travel posts – the people watching is as good as the landscape scenes! Oh Trudi, one of the most fun things about the trip was eating in the dining car and meeting some really interesting people, I loved it! I so enjoyed reading your post and you got me with the cliff hanger. Waiting to hear more. Beautiful shots. You’ve got me hooked, can’t wait for the next chapter! Thanks for taking me along .. what a wonderful way to describe a sleepless journey and what a journey all those hours on a train. I thought my 14 hrs in the hands or Air Canada was bad. *smile … looking forward to what will be following. You’re a brilliant teller. Thanks viveka, it was an exhausting but fun trip, and makes for some wonderful stories. I’m just getting started writing about my next adventure which was a road trip right back to the east coast. Oh, and your 14 hour Air Canada delay sounds awful! The 14 hours went very quick .. of them I had at leat 5 at Toronto Airport and had a chance to move around and be normal. Looking forward to read about your return journey. NIce story! Wonderful shot down the tracks – all of your picture seem to be full of stories. As another said, what’s next? I’ve been cross-country many times and, as a rule, I find people to be friendlier west of the Mississippi. There are exceptions, but that’s been my experience. This, coming from someone who grew up in Boston, but moved to the west coast in my twenties. Going back was always a bit of a shock. I’ve heard other people say that too, Gunta. An east-west divide or something. In the UK there’s a north-south divide too. I love the way you describe the people you meet with so much detail. Great travel writing, and nice shots, too. Looking forward to more tales of your travels! Great story! And, the photos, wow! Glad to hear you got a good night sleep. Oh what a shot that is- your first sight of the Mississipi! Ooh the cliff-hanger ending! Murder on the Orient Express, Stamboul Train, The 4.50 from Paddington, somewhere in this list there has to be an Empire Builder story. Events unfolding? Oo! can’t wait…. I’m getting ready to embark on a US journey myself. I love train travel and now I’m getting ready to combine it with budget bus travel via Mega Bus here in the US. It’s bound to be an adventure! I can’t wait to read the next part of your trip! This is almost a little novella with perfectly etched characters 🙂 Can’t wait to read about those unfolding events…. Hi Ailsa! I love train rides. They can be so relaxing, nice and slow. Thanks for taking us along on your ride. Sounds like you had a nice time. G’day Ailsa, part of the enjoyment of getting back into internet connections is catching up with your travels. Stunning photos and such interesting descriptions of the people you meet, I’m looking forward to the continuation….